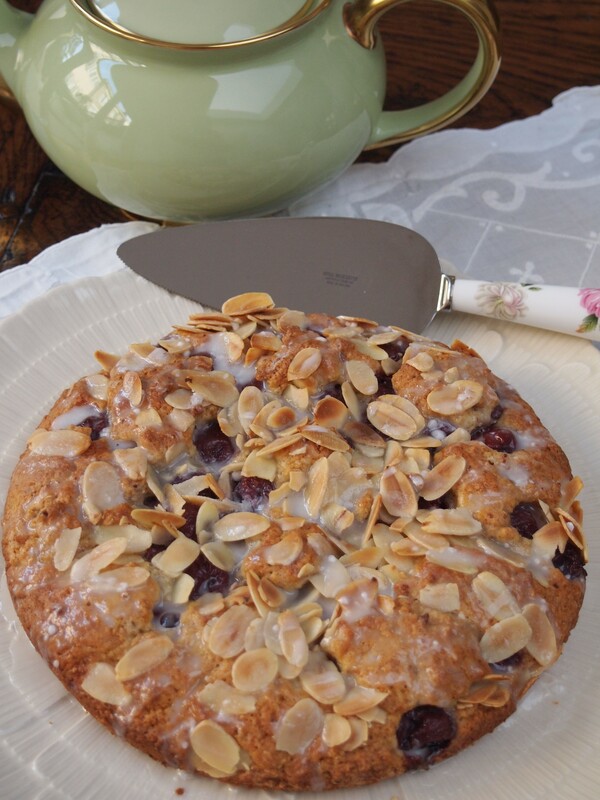 This is great cake to have with a cup of tea or coffee. It’s easy to throw together and you won’t need to get out any heavy machinery in the way or processors or mixers. The fruit can be switched around to suit whatever you have on hand, raspberries or blueberries would work well, fresh or frozen. Preheat the oven to 180C. Grease a round 9 inch cake pan. Mix the cherries with the sugar and set aside. In a separate bowl combine the flour, hazelnut meal, sugar, baking powder, baking soda and salt. In a small bowl whisk together the egg, sour cream and butter. Add the wet ingredients to the dry and mix until combined. The batter will be very stiff. Put half to 3/4 of the batter in the bottom of the dish in an even layer. I found the easiest way to do this was with greased fingers. The layer will be very thin but needs to cover the entire base. 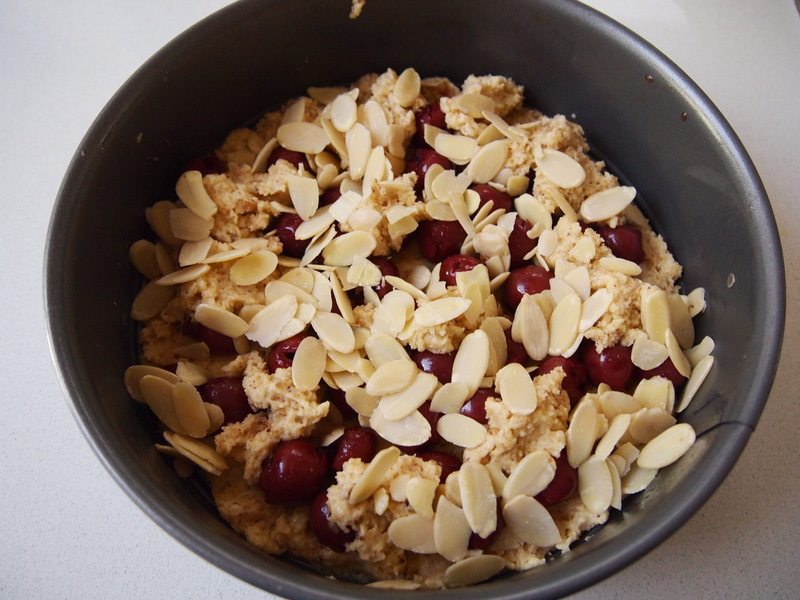 Add the cherry and sugar mixture evenly over the batter and top with the remaining batter. There won’t be enough batter to cover it completely, just dob it on in places. 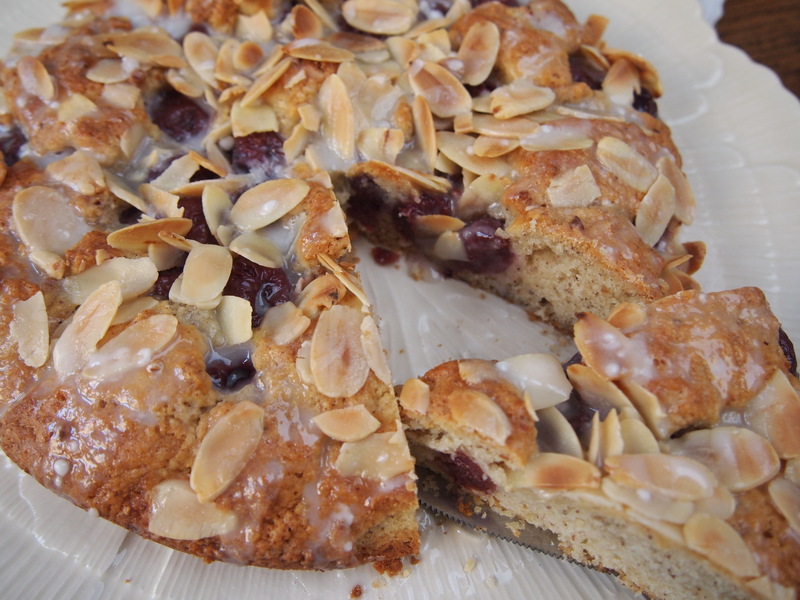 Sprinkle with the almonds and bake for 25 minutes or until a toothpick inserted in the centre comes out clean. Leave to cool on a wire rack before removing from the tin. For the Icing mix together all the ingredients and then drizzle over the cake.